Although plenty of racing games existed before mobile, I feel like the advent of iOS and Android devices spawned a whole new era. While it’s generally difficult to craft high quality simulation experiences for PC and console platforms, tons of developers are able to create arcade-like games for mobile, often times to great success. This goes for none other than Traffic Rider (Free), which feels like a fully-fledged racer in its own right. So what’s the point of Traffic Rider? Well, to ride through traffic of course! Using a motorcycle to split lanes and weave in and out of traffic, you’ll navigate linear tracks on your way to a finish line. The catch is that cars have a mind of their own, accelerating or braking in odd places. It’s tough to really get anywhere at all times, but the control scheme is so good that it will help facilitate your way through that challenge. There are many times where I’d drop acceleration, drift through a few cars, and it would always be a rush. You also get bonuses for maintaining a high level of speed and achieving near misses with traffic. You’ll progress through by way of a loosely tailored story mode, which beats most of the “endless only" games that get old after repeated play. The map is pretty massive with over 40 levels, as well as bonus objectives for reaching a better clear time. I would have mostly been content with just cityscapes, but there’s also long stretches of desert to navigate through, as well as highways with lots of different pieces of scenery, mountainscapes, and even a day and night cycle. 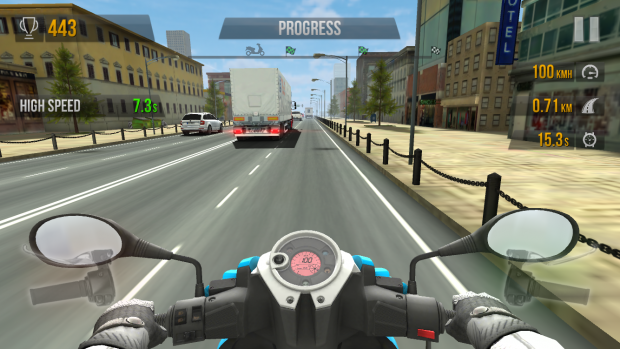 When it comes to other modes, Traffic Rider also delivers. Outside of the career map there’s an endless mode (with options for both one or two-way boards), a time trial gametype, or free ride. You’ll need to level-up to unlock most of these, but given how fun the game is to play it doesn’t feel like work in the slightest. I adore the control methods that they baked in, as games usually tend to force you into tilt or virtual pads. With Traffic Rider you can choose either method, with the latter sporting two different options (handlebar control or a standard d-pad). Throttle can also be controlled manually or set to automatic acceleration, the whole scheme can be inverted, and the sensitivity can be altered. It’s pretty comprehensive and should suit basically every player’s needs. My personal favorite is definitely tilt as it’s very responsive, and the throttle is perfectly placed so you don’t put your thumbs over the action, even with limited screen real estate. 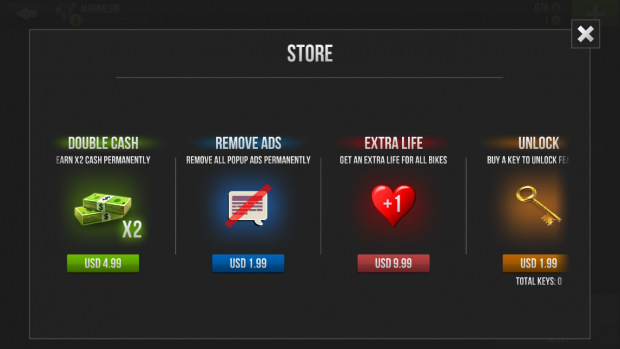 In terms of IAP, Traffic Rider is one of the least offensive free games. There’s a starter pack for $6.99 that grants you a new bike, cash, and gold, as well as the power to remove ads. Thankfully you can purchase any of these options piecemeal, in addition to the remove ad ability for $1.99, and a cash doubler for $4.99. The one thing that I don’t like however is the “key" purchase, which unlocks a mode piecemeal for $1.99. It’s a bit much since there’s multiple gametypes to be unlocked through this method, but general play will get you there eventually anyway. I was surprised by how much depth Traffic Rider has, and it’s in my regular rotation at this point. With responsive controls and a uniquely programmed set of AI cars to navigate, this one will keep you busy for a while.